What is your favourite pizza topping? Last night one of Sian's friends came for tea and we made homemade pizzas. I made pizza dough, squished big circles onto pizza stones, put everything and anything I could find in the pantry and fridge into the center of the kitchen table and called everyone in to start creating. There was pizza or BBQ sauce, mozzarella cheese, pineapple, ham, chillies, anchovies, sliced red onion, feta cheese. Lots of choice, or so I thought. When the kids ran into the kitchen they asked what they could put on their pizzas. I waved my hand over the assortment of toppings and said "anything!" She produced a bag of jellybeans from behind her back that her friend had brought to share. 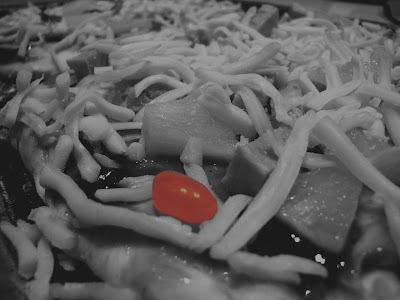 And so that is why last night we ended up with jellybean pizza, well, I let each kid put one jellybean on their pizza for a laugh. When the pizzas came out of the oven and we sat down to eat the kids were a little less sure of their adventurous taste buds. They left that corner of their pizzas until the very end. On the count of three each of them put the cooked jellybean into their mouths and chewed! Their faces went from unsure to big grins as they realised they weren't going to be poisoned. An unusual pizza topping for sure but probably not one we will be repeating! How do you get your pizza dough from sticking to the stone? I love pineapple and pepperoni on my pizza. I also use a stone and found if you season it well with oil (I used olive on mine) you don't have the sticking problem. I have one from Pampered Chef and the instructions say to only rinse with hot water and scrap the stone after use, never use soapy water. Sounds good. I will give it a try next pizza making session! This is awesome! :) And thanks for your encouragement! They have always called me "Mum" but I like "Mammy" too it is a really Irish word!!! What's for dinner Mum? Answered!